The Girl's Guide to Giving Back: EchoSign - Save Paper! Hi there- While today's post isn't necessarily a "traditional" gift idea, it really is a gift we can all give to the enviornment! 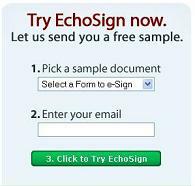 EchoSign is actually a company that my ingenious brother founded. 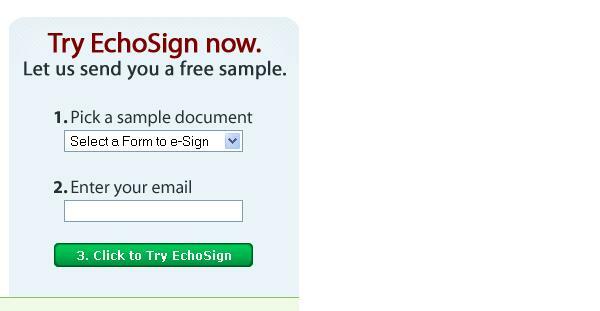 At its core, EchoSign is the easiest and fastest way to get a document signed. With EchoSign, you have unlimited document exchange, execution and tracking accessible anytime from anywhere. Now how does this give a gift to the enviornment? Well, according to the Environmental Defense’s forumla, an average size corporation, merely by using EchoSign for 1% of its paperwork, could save over 10,000 pounds of copy paper annually and save over 100 tons of greenhouse gases. According to Environmental Defense, over 4.6 million tons of copy paper alone are shipped each year, generating greenhouse emissions equivalent to over 2,000,000 automobiles. So in addition to saving not only time, money, and the frustration that comes with dealing with paperwork, you can also save as much as 10 tons of solid waste and 100 tons of greenhouse emissions per company per year (source: Environmental Defense). Pretty cool, eh? So please, try sending your insertion orders, human resource documents, contracts, and much more through EchoSign. Oh, and did I mention it's FREE to try!? I just looked at the drool for a second and saw your thread and wanted to see your work and to thank you for mentioning me and thinking of us. My Aunt died...my Mom has an infection...but Penny seems to be responding really well to her chemo and they plan to drop her down to once a month ...starting next month. You did a wonderful job here it is so full of resources. You and your Mom (and Emma) have not left my mind, heart or prayers. I will pass this site on! !